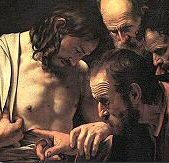 This was traditionally the feast of St. Thomas the Apostle; his feast is now celebrated on July 3rd. This day still marks many Christmas preparations, and so we are recounting some traditions attached to this day. St. Thomas day, St. Thomas gray, The longest night and shortest day. December 21 is usually the shortest day of the year, yet this day usually commenced the Christmas preparation of cleaning and baking. Although we no longer honor St. Thomas on this day, we can still use this day as a reminder to put in exerted efforts and start finishing our external preparations for Christmas. All the weeks before should have been more of spiritual preparation. In Tyrol and in parts of Canada, this was considered "pie day", with meat pies baked for the family, then cooled and frozen. They are saved for the feast of the Epiphany, and are thawed, reheated and eaten. In some parts of central Europe ancient customs of "driving demons away are practiced on the Feast of Saint Thomas the Apostle (December 21) and during the following nights (Rough Nights), with much noise, cracking of whips, ringing of hand bells, and parades of figures in horrible masks. In a Christianized version of this custom farmers will walk through the buildings and around the farmyard, accompanied by a son or one of the farm hands. They carry incense and holy water, which they sprinkle around as they walk. Meanwhile, the rest of the family and servants are gathered in the living room reciting the rosary. This rite is to sanctify and bless the whole farm in preparation for Christmas, to keep all evil spirits away on the festive days, and to obtain God's special protection for the coming year.